Hard to believe it’s been four weeks since I wrote my last blog post. We were on holidays at the beginning of May, and last weekend I visited my mom while she recuperated from cataract surgery. In Toronto, the month of May usually moves from just-past-winter to nearly-summer, and it’s no different this year. Andrew and I are enjoying the heat as we garden on this lovely Canadian long weekend. This recipe is probably more apt for those just-past-winter days, but I’ve been making it for two winters now and still haven’t posted the recipe. I didn’t want to let it wait for a third winter. These baked shells are comfort food at its best, and I’ll happily enjoy that any time of the year. Note: This recipe is particularly great with homemade alfredo sauce. But if you don’t have the time, store-bought is fine too. Spoon 1/2 cup alfredo sauce in the bottom of a 9 x 9″ baking dish (just enough to lightly coat the bottom of the dish). In a medium bowl, combine 1/2 cup alfredo sauce, shredded chicken, chopped broccoli, cheddar cheese and 1/2 cup Parmesan cheese. Add kosher salt to taste. 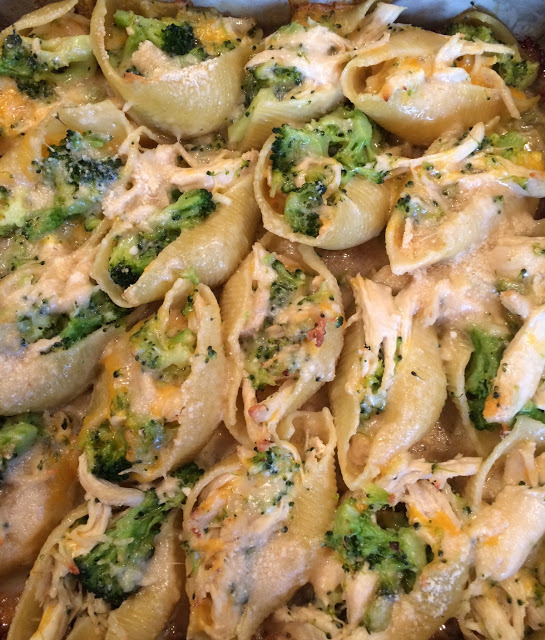 Spoon the mixture evenly into the pasta shells and arrange shells in the bottom of the baking dish. Sprinkle the rest of the Parmesan over the top. Cover with foil and bake for 30 minutes, then uncover and bake for 10 more minutes, until the shells are golden brown. This recipe screams of comfort food that's for sure, and with a lighter spring time essence. The filling is filled with such delicious ingredients, Beth! Thank you! Good to see you back, Beth!! We loved stuffed shells around here, but I'm in a rut with my spinach and ricotta version. I'm going to shake things up and try your version since the spinach hating son is home for the summer 🙂 Thanks!!! This looks really good Beth! most definitely comfort food 🙂 Alfredo sauce and broccoli are amazing together! Those stuffed pasta shells look droolworthy and ever so comforting! Glad you are back. I was wondering where you were. This sounds delicious and easily converted to vegetarian. Thanks! I have always wanted to try stuffed pasta shells. I love the look of this! The weather here has been decidedly unspringlike and cold. I even brought soup for lunch! So this is perfectly timed! These would be a big hit with my kids. I am not worried about it getting too hot to put something in the oven for a few weeks yet at least! 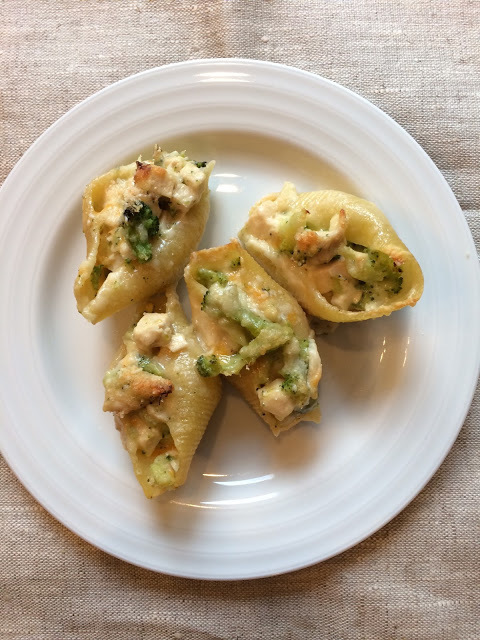 Hi Beth, I love pasta with a white sauce like this one myself, it's my favorite way to enjoy, looks delicious with all that broccoli and cheese sticking out of the shells. Thanks for letting me know, Monica! I'm so glad you liked the chicken pot pie. It's one of my staples and I'm glad you (and your husband) like it too! Hopefully your Mom is doing well and you are on your way to fully enjoying the warmer weather:) It seems Mother Nature has decided we needed an abnormally chilly wet Spring this year. I suppose it's the price we pay for hardly any snow fall this year. This dish, as someone else said, would be welcome in our house at any time of year. I love the change-up of Chicken and Broccoli. And, who doesn't love a nice Alfredo Sauce! Happy to see you back, Beth. Hope your mom is doing well now. This stuffed pasta shell is the best comfort food ever. Totally my type of dish and a great family meal! Hope your mom is doing well! And good to see you again. Particularly since you've given us this terrific recipe. Love pasta anything, and the flavors in this are awesome. Thanks! Lovely Beth!! I love Jumbo pasta shell, delicious!! That looks so delicious! Of course, everything would. My hubby and I are on this no-carb diet, which is really hard because EVERYTHING has carbs, especially pasta. But it's working, so what can you do? I can eat stuffed shells any time of the year and this version sounds great. Now that is my idea of comfort food. Lovely. Dear Beth, a beuatiful recipe. It sounds so good and looks even better. I even have a big box of these lovely Italian huge pasta shells – they are perfect for filling with delicious food and your filling sounds amazing! I would love to give it a try! Andrea – Hope you mother is feeling much better by now! Nice to see you blogging again! You have been busy! Hope your mom is fully recovered and has much better sight now. This dish sounds just the ticket for cold nights in. Oh this looks delicious and love the color! what a magnificent way to put some broccoli on the table! this is a delicious creation, beth!